The X-Men enter the Siege Perilous and Wolverine is crucified by the Reavers. Chained to a large wooden X outside the X-Men's Outback town, Wolverine awakens as Donald Pierce and the Reavers approach. Pierce taunts the defeated X-Man, but Wolverine manages to make him angry, and Pierce storms off. 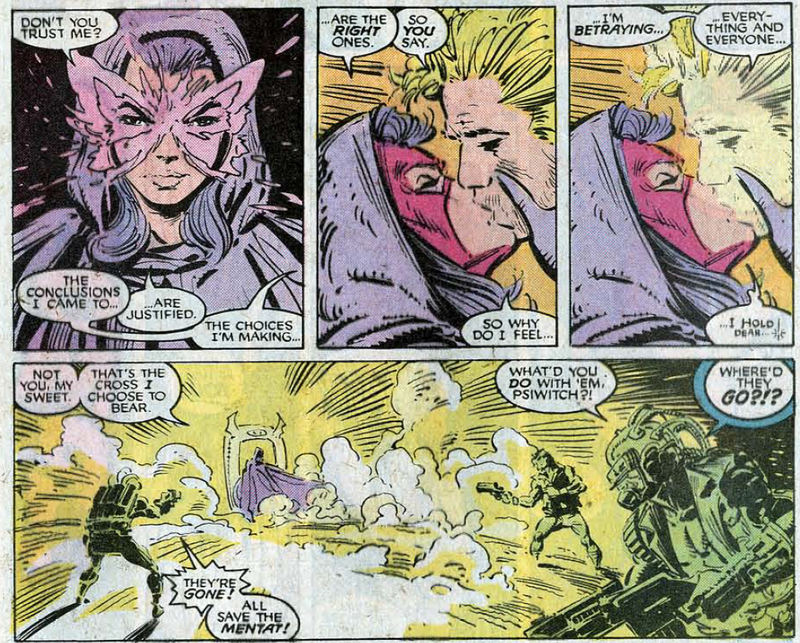 The Reavers proceed to search the town, believing they saw someone, but Jubilee manages to evade them. Outside, Wolverine slips into a fever dream, hallucinating the arrival of first the X-Men and then some of his old foes before entering Dreamtime and reliving first his capture, and then the X-Men returning from the Savage Land and being telepathically coerced by Psylocke to enter the Siege Perilous in order to escape the Reavers. That evening, Jubilee watches in horror as the Reavers crucify Wolverine, driving stakes into his hands and feet in an effort to make him scream. Pierce then crushes the Siege Perilous gem, telling Wolverine his friends will never be coming back, before the Reavers are driven inside by the onset of a massive storm. During the storm, Jubilee debates whether or not she should emerge from hiding to help Wolverine, or stay where it's safe, while Wolverine uses his pain to go berserk, ripping himself free of the X and collapsing to the ground. Looking up, he reveals that he knows Jubilee is watching, and calmly asks if she'll give him a hand. This issue concludes the dissolution of the X-Men, as the remaining active members of the team (Psylocke, Dazzler, Havok and Colossus) enter the Siege Perilous in order to escape the death Psylocke forsaw last issue. This effectively disbands the team, leaving the series a team book without a team for the first time since the government ordered the X-Men to disband in the wake of Professor X's death, way back in issue #46. Psylocke will pop up again shortly, and maintain a presence in the book moving forward, and it won't be too much longer after that before Colossus is back to what we know and love (though his absence will mark his longest time away from the book yet), but while we'll see both of them again before too long, this issue essentially marks the last time Havok and Dazzler appear as X-Men, the former eventually emerging from the Siege Perilous to become a Genoshan Magistrate and then spending most of the 90s in X-Factor and/or a series of convoluted storylines after which he'll eventually rejoin the X-Men proper in the 00s, while the latter, following her brief post-Siege appearance, functionally disappears from comics, a few guest star appearances here and there aside, until Claremont briefly dusts her off for his New Excalibur series. Wolverine returns to the series this issue, ending his absence which began in issue #246. He, along with Jubilee (and eventually Psylocke) will become one of the recurring factions of X-Men the series follows during this "non-team" era. The cover of this issue is one of the series' most iconic. Wolverine begins hallucinating the presence of people from his past in this issue, a habit that will continue on and off pretty much up through "X-Tinction Agenda" and the formal reformation of the team. 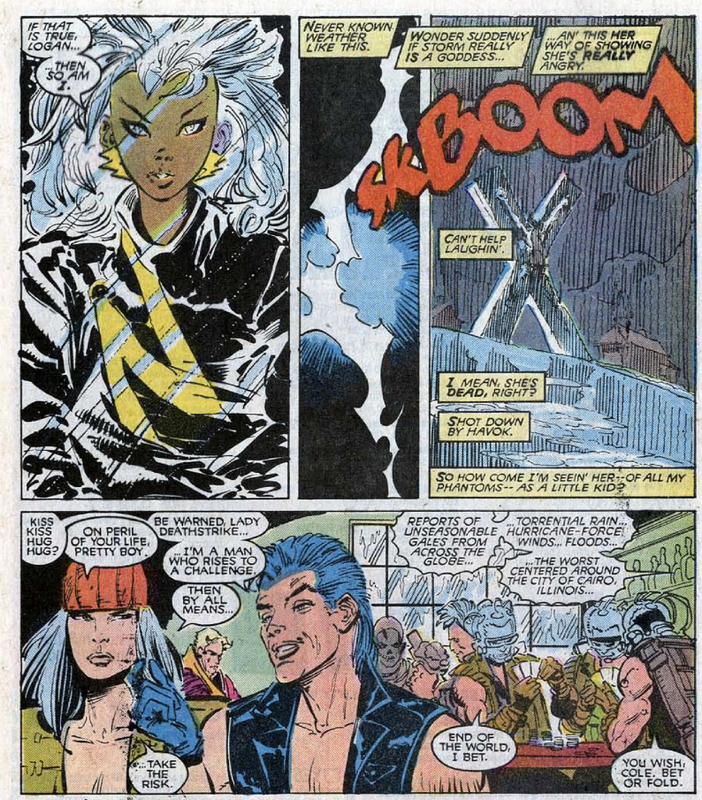 He also sees Storm as a child, and there's reports of major storms centered on Cairo, Illinois, both of which are teasing Storm's upcoming return and the condition she'll be in when she appears. Jubilee's rescue of Wolverine at the end of the issue is the first time she's interacted directly with any of the X-Men, and marks the beginning of their hero/sidekick relationship, a la his previous relationship with Kitty Pryde. Wolverine appears in this issue, and all his subsequent appearances in X-Men through issue #268, between issues #23 and #24 of his regular series. 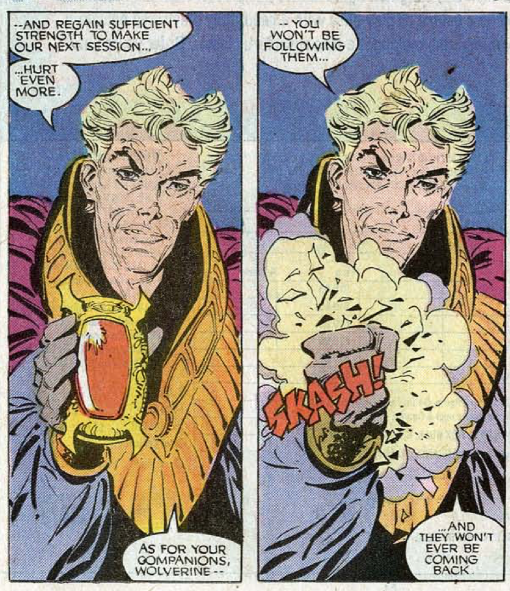 Pierce is referred to as a former White King of the Hellfire Club, which is incorrect (he was the White Bishop). It's established that Pierce helped turned Cole, Macon and Reese into cyborgs, and that he is responsible for the creation of the original Reavers (the ones the X-Men mostly decimated in issue #229). It's suggested that Jubilee is immune to the town's sensors, another idea (like her immunity to telepathy) that seems built on plot convenience and goes mostly unmentioned moving forward. In one of his hallucinations, Wolverine is taunted by Sabretooth and Ogun, who say that nobody gets to kill Wolverine but Sabretooth, and idea previously suggested in Classic X-Men and Wolverine, but appearing here in X-Men for the first time. It's made clear that Psylocke used her telepathy to make the rest of the X-Men okay with entering the Siege Perilous, explaining away how quickly they all agreed to the idea. Before then, though, Havok contemplates calling it quits anyway, and there's no reason to believe those aren't his own thoughts. Pierce crushes the physical manifestation of the Siege Perilous, ending its role in the book as well. A rather lengthy letter runs down all the lingering and unresolved plot lines in the book, pointing out many of the things we've pointed out here. 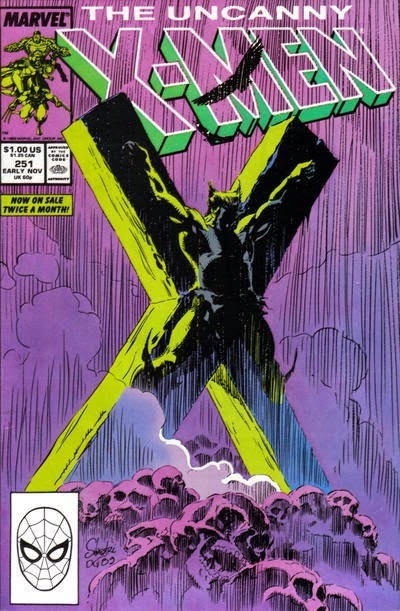 Without a doubt, this issue, wrapped in one of the series' most iconic covers, is the centerpiece of the "Dissolution and Rebirth" storyline, and functions as the climax to the "dissolution" half of the plot, with the four remaining X-Men entering the Siege Perilous and disappearing, effectively disbanding the X-Men just as Wolverine returns to bear the full brunt of the Reavers' revenge. Of course, Claremont's telling of those events is much less straightforward, as he begins the issue in media res, with Wolverine already a captive of the Reavers and the rest of the story, including the X-Men's disappearance, told via a surreal mix of Dreamtime flashbacks and fever dreams that help sell Wolverine's overall disorientation. 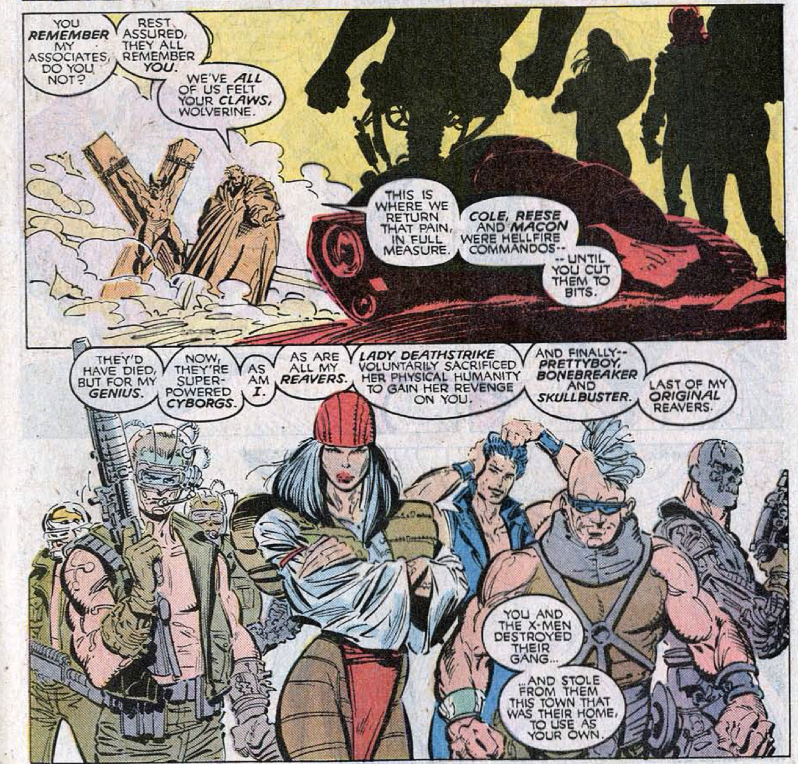 Just like the character, readers aren't sure what's real or imagined throughout the story, and in true suspense movie fashion, Claremont, Silvestri and Green keep the details of the Reavers' torture of Wolverine off panel, conveying instead the extent of the violence performed on him via the Reavers' glee and Jubilee's horror. It's an effectively intense depiction of one of the series' darkest moments yet, and a great kickoff to a truly unusual and unique era for the book. Tomorrow, a religious interlude in New Mutants #81. Friday, more fun on an alien world in X-Factor #46. Next week, the Reavers hunt for Wolverine in X-Men #252. 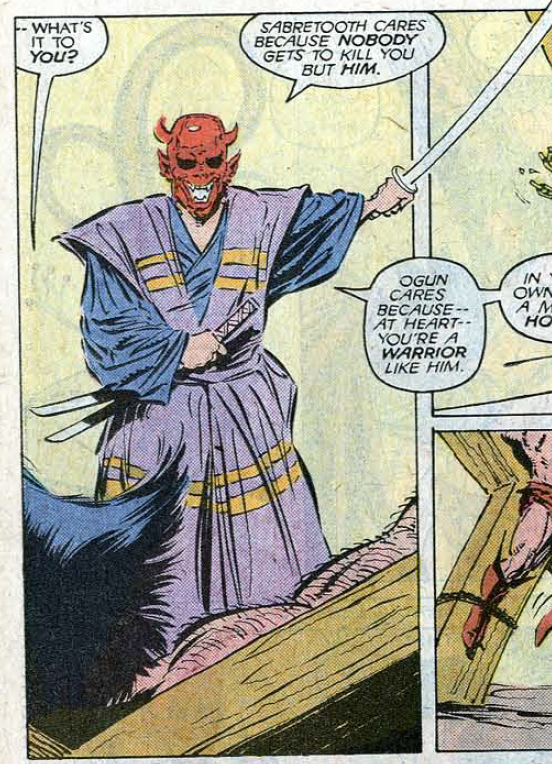 Hilariously in the previous go in #205 he had already managed to escape from Lady Deathstrike and Reese, Cole and Macon by the time we where allowed in, so it's a development. Someone has fun with the sound effects on this one. The Reavers kick a door in to a "Boot!" and the Siege Perilous dropping and making the "Chink!" after Betsy enters it is just wrong. No one really brings Betsy's supposed betrayal up ever afterwards to my knowledge (are people other than Wolverine aware of it? ), and I do feel she had all the reasons to believe here premonitions were correct and that the Siege Perilous was the only option. If we count Carol residue as a person, 50 % of the X-Men entering Siege Perilous will never make it back to an X-Men member. Wolverine with all torture and all can be forgiven thinking Pierce has enough cojones to have made it into the White King in the Inner Circle. "being telepathically coerced by Psylocke to enter the Siege Perilous in order to escape the Reavers." "it won't be too much longer after that before Colossus is back to what we know and love"
"marks the beginning of their hero/sidekick relationship, a la his previous relationship with Kitty Pryde." It's quite symbolic that one of the people he hallucinates is Kitty, and unlike many of the other women only appearing for a panel or 2, Kitty's is somewhat more significant. A nice passing of the torch, whether intentional or not. "It's made clear that Psylocke used her telepathy to make the rest of the X-Men okay with entering the Siege Perilous, explaining away how quickly they all agreed to the idea." She does get a lot of crap for that. Then again, given the circumstances, it was probably for the best. Despite CC's efforts to convince us otherwise, I do think the full post-FOTM roster would have defeated this version of the Reavers. But given the shape the team is in at this point, they would have been slaughtered. "Havok contemplates calling it quits anyway"
Havok doesn't really factor Wolverine in his decision, and seems under the impression Wolverine is no longer a member? He does say only the "four of us left". If the Reavers weren't advancing on them, and Psylocke didn't do what she had to, would they have just up and left without him? I can imagine them leaving a note taped to his house's door "Dear Logan, We quit. Yours truly, Alex, Betsy, Peter, and Ali. P.S. We left you some beer in the fridge". And this issue is where the "what the fcuk?!?!?" aspect of the series gets kicked up another 5 or 6 notches. I remember at the time reading it and thinking did this just happen? Where are we going with this? It definitely made me want to read the next issue for sure. A very interesting, chaotic era is about to follow, and while it might not be to everyone's tastes, I do give CC credit for trying something so unexpected. Other than a few instances between her and Wolverine, no, neither of them really discuss it with anyone else. 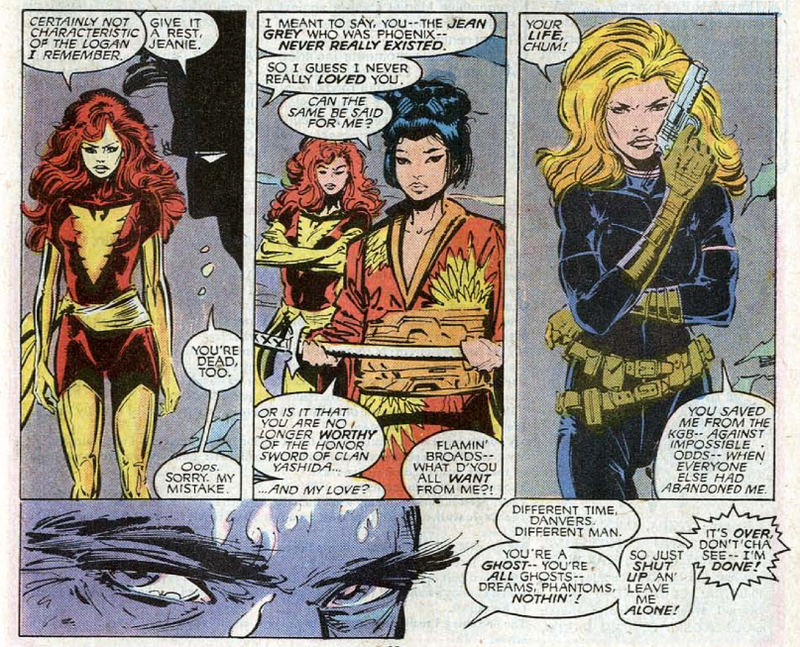 Psylocke herself brings up her manipulation of the team in #258. It's weird, because this issue seems like a deliberate callback to #205, with the in media res storyline of Wolverine being tortured and then being helped by a spunky Lil' darling, yet Claremont doesn't seem to remember the story that well, what with Pierce's claim that he built ALL of the Reavers. Issue #205 days differently for the case of Macon, Cole and Reese. This confusion about Pierce's "role" in the creation of the Reavers continues throughout their appearances. @Teemu: the Siege Perilous dropping and making the "Chink!" after Betsy enters it is just wrong. Ha! I totally missed that. That's pretty (unintentionally) awful. At least during Claremont's run (including vol. 2, when Colossus rejoins). Both Havok and Dazzler eventually do rejoin much later down the road (Havok during Chuck Austen's run, Dazzler during Fraction's run, when pretty much everyone is an X-Man). @wwk5d: Not till the Muir Island Saga, at least. True, though his rejoining still happens relatively faster than Havok & Dazzler's. I do think the full post-FOTM roster would have defeated this version of the Reavers. But given the shape the team is in at this point, they would have been slaughtered. Agreed. I mean, they took out a much larger group of Reavers once already, and even without surprise and the fact that these Reavers are more motivated, it still stands to reason the full roster could have prevailed. A very interesting, chaotic era is about to follow, and while it might not be to everyone's tastes, I do give CC credit for trying something so unexpected. Indeed. As we'll see, I have some issues with the execution of some of these upcoming ideas, but I definitely appreciate the effort to do something weird and strange and different, even if it is ultimately flawed in places. @Jonathan: Claremont doesn't seem to remember the story that well, what with Pierce's claim that he built ALL of the Reavers. Issue #205 days differently for the case of Macon, Cole and Reese. I suppose the No Prize-y explanation could be that Pierce gained his cybernetic know-how from Spiral, making both issue #205 and his claims in this one kinda true. Not that such an idea is ever suggested in print, of course. It remains, as you say, a point of confusion. This issue always seemed like the payoff that being a continuing X-Men reader frequently promised, but didn't always deliver. Art and story here both were great, and like #205, it was nice to finally have another great Wolverine-centric story in the pages of the X-Men. I never realized what a huge break this issue would prove to be from the norm, setting the stage for an often-flawed era. 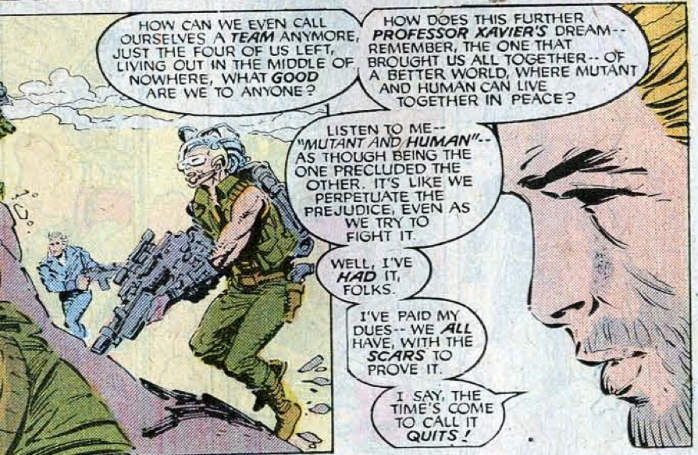 (Heck, I never truly realized there were even "eras" back then, other than Byrne and post-Byrne.) Still, this one has to be among the highlights of my run as a then-current reader. 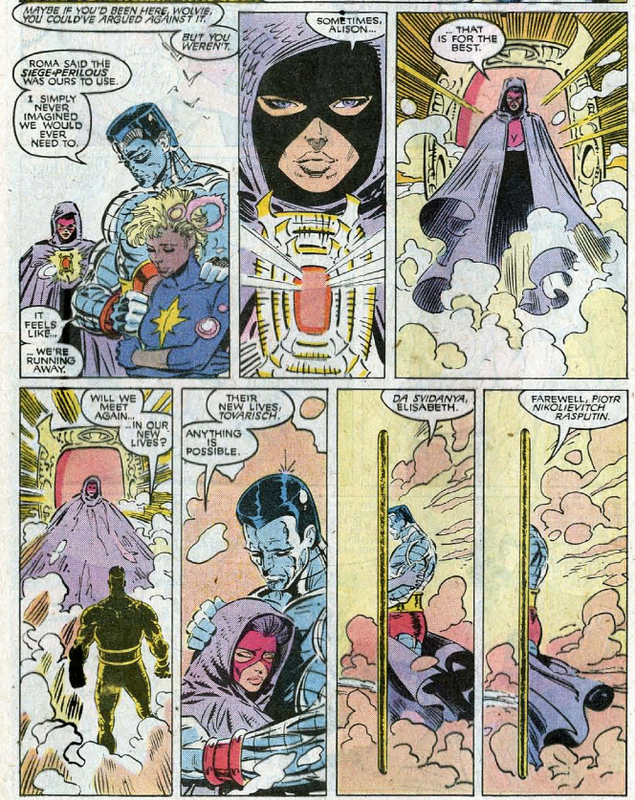 Reese, Cole and Macon were already cyborgized by Pierce and appearing as such on-panel well before #205, when Hellfire Club attacked Xavier's school in 160ish. Pierce himself was a cyborg in DPS through his own skills. We do not retcon DPS to make it more convenient for us, we are not Marvel of 1986. Colossus will rejoin in Muir Island Saga, I was thinking Havok and Dazzler. If they return only after Claremont did, it doesn't count. "It's suggested that Jubilee is immune to the town's sensors, another idea (like her immunity to telepathy) that seems built on plot convenience and goes mostly unmentioned moving forward." In the next issue we find out that the computers aren't always obeying the Reavers' search commands, with the implication that it's connected to the weird things that have been going on with the computers. Of course, like with the Kitty-Saturnyne plot in Excalibur, that plot goes nowhere. "Before then, though, Havok contemplates calling it quits anyway, and there's no reason to believe those aren't his own thoughts." I always assumed that Betsy was manipulating him as soon as they got to Australia- it's too convenient otherwise. "No one really brings Betsy's supposed betrayal up ever afterwards to my knowledge (are people other than Wolverine aware of it? ), and I do feel she had all the reasons to believe here premonitions were correct and that the Siege Perilous was the only option." But (a) it was Gateway, who helped the Reavers KILL CHILDREN, who suggested the Siege, (b) it should have been the X-Men's decision to make, (c) Betsy has done plenty of OTHER ethically questionable things, like threatening to kill Alex, (d) Alex wound up falling into the hands of the Genoshans and (e) her kissing a mind-controlled Alex is kind of creepy. "Claremont doesn't seem to remember the story that well, what with Pierce's claim that he built ALL of the Reavers. Issue #205 days differently for the case of Macon, Cole and Reese." But the dialogue in issue 152 implies that they ALREADY have cybernetics. I think the idea is supposed to be that Pierce designed them and Spiral merely repaired/upgraded them. Why does Pierce hate Wolverine so much in this story? Wolverine slashed his arm in the Dark Phoenix Saga. Must have taken it very seriously (and Pierce seems to be the type of fellow who takes any trivial offense too seriously). Also, one can argue that Pierce wanted all the X-Men to pay, but seeing the team gone and free from his grasp, threw all his hate on any X-target he could attain: Wolverine just happen to be that person. I really like this issue, both on its own and as the lead-in to the "teamless" era. Good stuff is upcoming, including Banshee's long-awaited (by me, at least) return to action! The Spiral background for Pierce's tech would be intriguing though in that regard that it would be Mojotech and Mojo DOES do that kind of tech, giving an extra angle for Betsy to avoid having any more of that no matter what it takes. 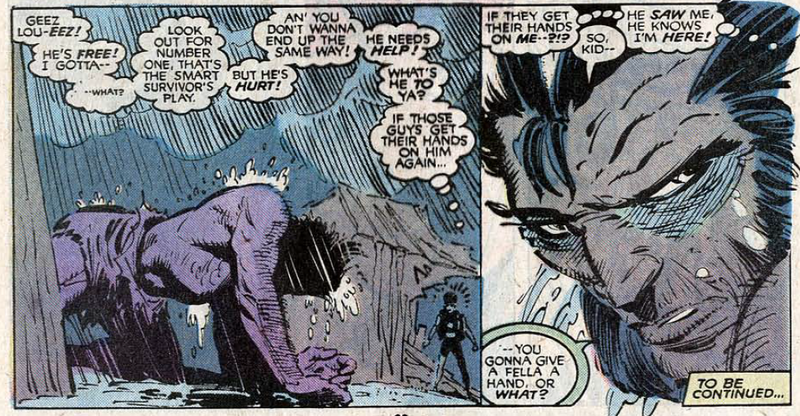 It's Wolvie's fever dream where it all takes place though so it's not necessarily how it actually went but a scenario brought up by his subconsciousness or even Reaver-projected, extremely well-informed torture. The computer at the base does access people's dreams and deliriums... desires, despairs, destinies and even death. One of my favorite issues; this comic had a massive impact on me as a kid. 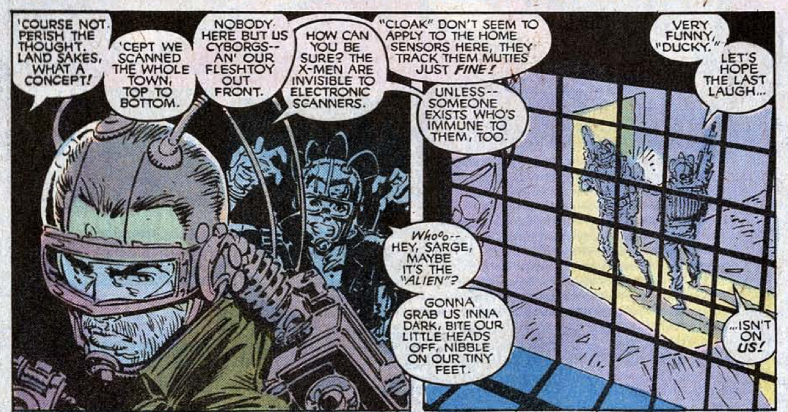 I really wish Claremont could've told the story of the mystery computers at the Outback base. If they're behind Wolverine's fever dream/flashback to events he didn't experience, that should've been established somewhere. As it stands, it reads as if Wolverine just kind of develops a new power. I can't find it on Youtube anymore, but back in 1992, MTV did an afternoon of VJ segments at Marvel's offices. They interview Bob Harras in his office, and on his bulletin board, is the cover of this issue. It is possible that Wolverine's fever dream/flashback was due to Gateway, no? I thought we knew — or at least presumed through the narrative's implicit suggestion — that Pierce and/or the Hellfire Club was responsible for the bionic augmentations to Cole, Macon, and Reese back whenever they first popped up again after their apparent slaughter by Wolverine. This should've been #250. I know that it only starred one X-Man in "reality" but it had a retrospective quality in the form of Wolverine's titular fever dream and was a much stronger issue (as well as being more representative of this current era of the group) than last issue. Wolverine's hail-and-farewell visitations from the women in his life, during his X-Men tenure anyway, is something of a trope by now, I think, yet it's not any less engaging for that and there's enough that we don't know about Gateway that we can, or at least I can, accept that it incorporates a recap of actual events without fussing. I need to know why Pierce looks like he's being swallowed alive by Volstagg's formal wear. While it's never overtly explained where the Reavers came from, Claremont hadn't left it as a dangler, it's just us fans weren't paying enough attention! That is, in Uncanny X-Men #251, Donald Pierce refers to Pretty Boy, Bone Breaker and Skullbuster as the "last of my original Reavers". Then in Uncanny X-Men #252, he says to all the Reavers: "My genius crafted the bionics systems that make you all far more than human or mutant. And what I built, I can just as easily destroy", and then notes that Lady Deathstrike is different since she was turned into a cyborg by Spiral. While Cole, Macon and Reese were operated on by Spiral in Uncanny X-Men #205, they were described as cyborgs as far back as Uncanny X-Men #152, and since Pierce was with the Hellfire Club then it makes sense he was responsible for their original cybernetics and Spiral just upgraded them when she operated on Yuriko.